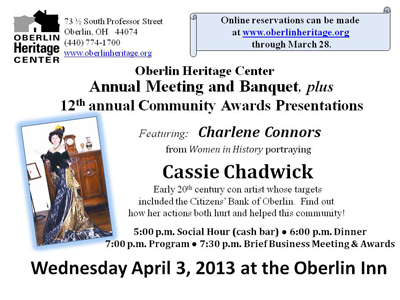 April 3 (Wednesday, 5 -8:30 p.m.) Plan now to attend the Oberlin Heritage Center's Annual Meeting and Dinner, featuring costumed historical educator Charlene Connors portraying the infamous, outrageous, and notorious early 20th-century Oberlin and Cleveland con artist, Cassie Chadwick (1859-1907). Ms. Connors is part of Women in History, a non-profit educational organization based in Lakewood. The evening includes presentations of the Oberlin Heritage Center's 12th Annual Community Awards, and a brief OHC business meeting. Festivities begin with a social hour (optional) at 5 p.m., dinner at 6 p.m. and the program following around 7 p.m. Register online or contact (440) 774-1700 or members@oberlinheritage.org for more information. Location: Oberlin Inn.